Flavoured soup mix. A delicious combination of corn and chicken flavours with a smooth, creamy texture. 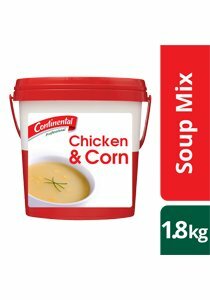 Every product in the CONTINENTAL Professional Soup range has been specifically designed for the needs of food service professionals. The range provides high quality soups whilst ensuring maximum yields and no wastage. Servings per package - 152. Serving size - 170 ml prepared product.